A raw and unedited account of Finn's journey to a new heart. It was 3:00 PM before I was finally able to make myself leave Finn's room today. Typically when I feel this way it's because I am so worried about him, fearful of what will transpire while I am gone. However, today was different. Today I didn't want to leave his infectious smiles and happy play time. For over a week Finn has been struggling to fight rejection and a lung insult combined. He had been mostly resting and uncomfortable for the last week. Not today! Today his periods of awake time have been that of a typical baby and infused with the most adorable smiles. This morning I opted to wear a shirt I had recently bought supporting a heart mama who lost her son too soon. The adorable shirt has "Happy Soul" simply displayed across the chest. Before purchasing it I paused. 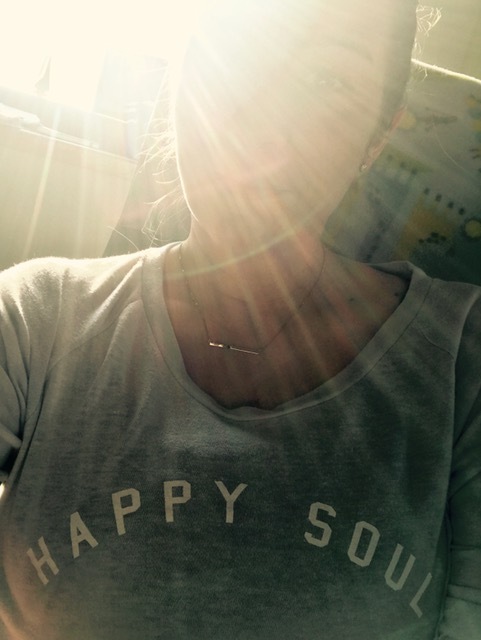 How can I buy a shirt with the word happy on it? I am sad. I am dark. I am twisty. Is it appropriate to wear this statement so boldly while walking around the cardiac floor at St. Mary's? Then I thought about me, who I am under all this sadness. Under this exhaustion and behind the tears. Am I still me? They say children change you but having children REALLY changes you. You see the simple good in the world. I realized that playing in the dirt at the park is better than any mud-mask facial and watching my husband and son singing Baa Baa Black Sheep with helmets on and hockey sticks as guitars outranks any concert I can buy a ticket to. The day I became a mother I truly went from selfish to selfless in a matter of moments. 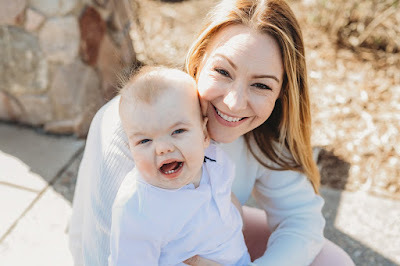 How can one tiny human change your very being? After having Asher I looked back on my life without him and feel pity for the person I was because I didn't quite know how worth living life is. When Finn entered the picture that feeling was intensified beyond anything I could imagine. His illness and struggles have made that ever so much more present. When death stares you in the face day after day, you really start thinking a lot about life. I ran down to grab lunch today and sat next to a woman with what I presume were her grandchildren. As I quickly ate my salad and peeked on the children being just that, she turned around and said to me "Oh, I am so sorry. Are they bothering you?" Bothering me? They are being kids. They were laughing, climbing around and begging for more chocolate. After being surrounded by sick children on MB 5B it was refreshing to hear laughter and happiness. It made me miss Asher but also made me grateful for his health. Additionally it made me think, we shouldn't be sorry for our children being children. They should be acting like that. We shouldn't stifle their energy, life and happiness. Perspective. I can't wait until Finn and Asher are entertaining the table behind us at lunch. For that I will not apologize and I will not squander those moments because now they are what I live for. The simple, normal life moments. I stayed in the cities for an additional night this week. After a long week in Rochester I needed some extra time with my big. His school social was Wednesday night and I looked forward to seeing him with his friends and teachers. It's times like these that I want to be normal but I am quickly reminded that I'm not. As two friends talk about maternity leave I felt the wind get knocked out of me. Is it showing? How long can I hold back the tears? Will it be awkward if I just walk away? Then I see a baby Finn's age squirming around on a picnic blanket, rolling over, laughing, mouthing toys and I feel sick to my stomach. The grandmother kindly says hi and offers a friendly wave as I try to look past them and not show my weakness. After a brief and undercover cry sesh in the car on the way home I started to think that I can't go back to life. I can't unsee or unknow what I have seen and now know. 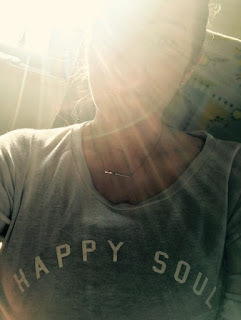 Is my soul truly happy? I thought it was, underneath all this pain. Finn is on another one of his upswings which is wonderful but we've been down this path before. This is the happy road we find ourselves on right before he trips and falls in another pit. He got up faster this time and he seems to have not fallen quite as hard but it's impossible to believe that this will be the last stumble on his way out of the hospital. 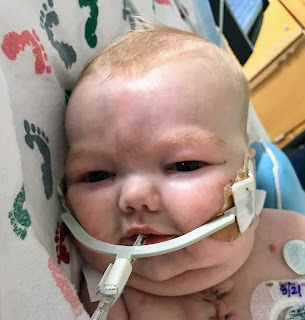 After six days of successful extubation Finn's trip down to the cath lab to inspect his rejection pressures seems to have caused some bleeding in his lungs. No one can quite explain why or how but the timing lines up. For the last week he's remained intubated to help clear the blood that drowns his lungs. The goal is still to get the breathing tube out, however the bleeding has to stop first. So, although the rejection has mostly resolved we are back facing a familiar enemy, the troubled lungs. They have improved but not enough to actually make any efforts towards weaning. Dr. Haile and Dr. Oliver reiterated to me today that often in medicine we take action and try to do things for the body. This is one of the times where we have to allow the body to do what it does and that takes time. So, we wait. Once his lungs recover we will start back on the breathing trials and then work towards removing his ET tube again. When leaving the room at RMH tonight I ran into a fellow cardiac parent. They have a son on the floor, a newbie, who arrived a couple of weeks ago after birth. I am not sure of his defect but I know that he had surgery and is recovering nicely. So nicely in fact that they are being discharged tomorrow. When he told me that I smiled, I said "Congratulations" with a big happy smile. "How wonderful!" Immediately upon turning the corner the tears streamed down my face. They caught me by surprise. I know I am happy for them, I wouldn't wish this on my enemy, but our turn seems so far away with this new battle. Since we have been here at Mayo two sweet girls, one little boy and their families have come for surgery, recovered, left, come back for follow up surgeries, recovered and left. It's so bittersweet. Their mothers become my support, my people and then they leave. I miss them terribly even though we message each other almost daily. Of course you want nothing more than to never see them again here on the unit but the tinge of hurt and envy when they leave is unmistakable. I've never wanted anything so badly than to be the ones leaving this floor. Deep down I know I am still happy. My soul is a happy soul. I will fight through the sadness and find that joy that I miss so much. Without a doubt the dark and twisty Ali will somehow start to feel lighter and less tangled up inside, but when? Is it our turn yet? It feels as though we pay our dues over and over again with no reprieve. I want my maternity leave, I want my baby to put toys in his mouth and wiggle around on a picnic blanket, I want to leave this damn floor and not look back. I know it's coming, I just don't know when. I do know that my soul will truly be happy again, just as soon as we get out of here. Rejection, Infection and Clots Oh My!